“Lets defend the Constitution from the Constitutional Court justices.” Second day of protest on Feb. 25, 2016 in Skopje, Macedonia. Photo by Vancho Dzhambaski (CC BY-NC-SA). 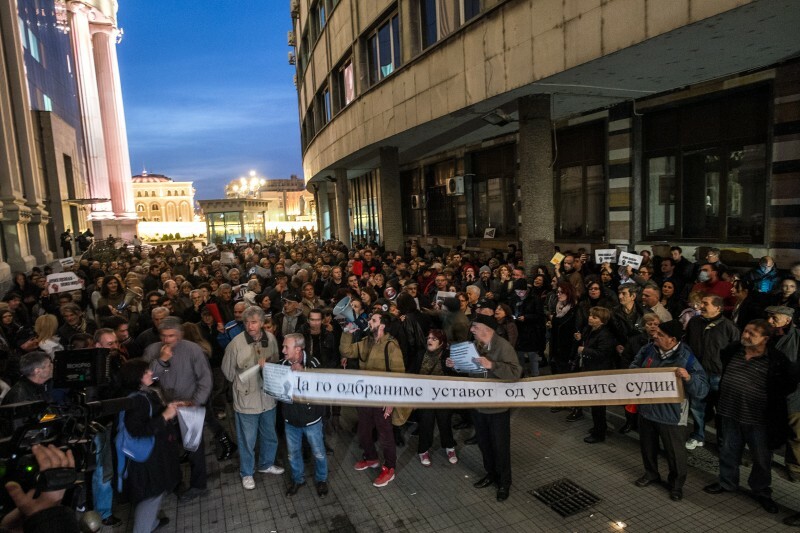 Macedonian citizens held a series of protests in front of Constitutional Court in Skopje, outraged by the court's decision to deliberate on possibly changing the country's Amnesty Law to remove restrictions on pardoning crimes related to electoral fraud, child molestation and terrorism. The first two protests, organized by the civil platform Ajde!, took place on February 24 and 25, just after the Constitutional Court agreed to consider the initiative. The proposed changes to the law were submitted by a young lawyer who received his license in December 2015 and happens to “share office space” with the lawyer defending former Minister of the Interior Gordana Jankuloska, one of the key figures being investigated for allegedly rigging elections in 2013 to guarantee that the VMRO-DPMNE party won. While the court usually takes up to two or more years to consider similar initiatives, this time it took just few weeks. Out of nine justices, five voted to accept it. 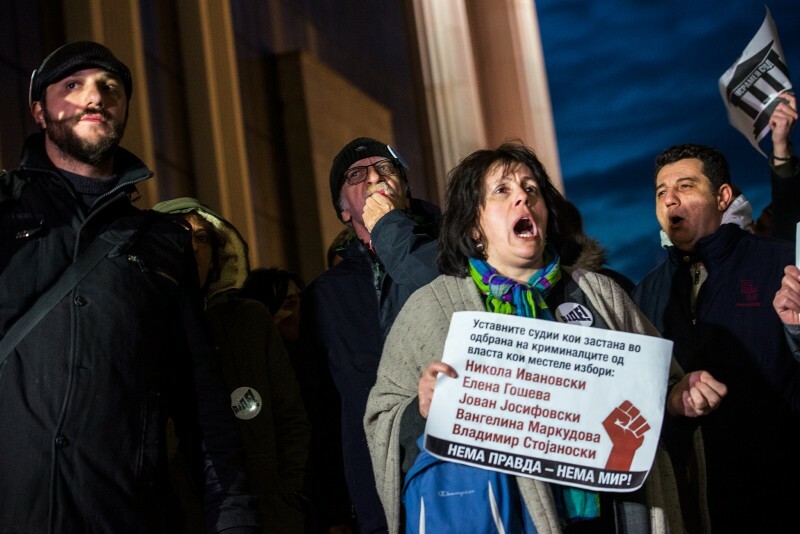 Citizens, opposition politicians and civil society organizations expressed their anger at the court's move, suspecting covert interference from the ruling VMRO-DPMNE. While the party denied involvement, some social media users have been digging up articles and other data pointing to links between the five justices and VMRO-DPMNE. All five were appointed to the bench by the parliamentary majority dominated by VMRO-DPMNE. Some have close personal ties with party officials, and their family members hold positions in the VMRO-DPMNE government. For instance, the opposition revealed that the daughter of one of the justices was head of the committee for the botched 2011 census. Доколку се докаже дека имало изборни нерегуларности и злосторничко здружување против изборите и гласањето во Р. Македонија, попрецизно претседателските избори во 2014 година, тогаш д-р Ѓорге Иванов кој доби втор мандат за Претседател поддржан од владејачкото мнозинство во Собранието на Р.М. би бил нелегитимен Претседател на државата, со што по автоматизам сите негови одлуки, па дури и тие одлуки за помилување автоматски стануваат ништовни односно, нелегитимни, поточно би биле нелегитимни и ништовни? 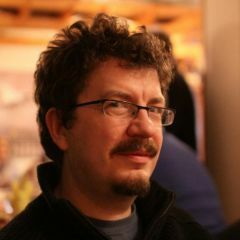 If it's proven that there were election irregularities and criminal conspiracy in the elections and voting in the Republic of Macedonia, more precisely the 2014 presidential elections, then George Ivanov, PhD, who got his second presidential mandate with support of the ruling parliamentary majority, would be an illegitimate president of the state. Would that make all his pardon decisions void and illegitimate? At the protests in front of the court, participants shouted slogans against the “judicial mafia” and the “gravediggers of democracy” and chanted “no justice – no peace!” They also pelted the faux-baroque facade with eggs. Both at the court and on social media, protesters demanded accountability from the five justices, whom they named by name. Photo by Vancho Dzhambaski (CC BY-NC-SA). The court's decision to consider the initiative also drew attention from the representatives of the international community in Macedonia. For instance, the UK ambassador shared his puzzlement on Twitter. By some estimates, the court could begin to deliberate on the initiative in April. Ajde! is organizing the next protest in front of the Constitutional Court for Monday, February 29, at noon.